You know how when you buy a new car you start seeing the same model everywhere you drive? I seem to be experiencing the same phenomenon with Olivier Strebelle sculptures. A few days ago I posted that I finally discovered who created The Lions of Atlanta, the giant bronze lions in front of the Marquis buildings. Well, not too far from there, on the circular path at the base of the Suntrust Plaza building, one of Atlanta's tallest, is another Olivier Strebelle bronze sculpture. 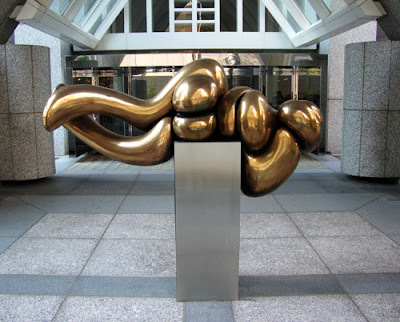 Created in 1974, my latest discovery is Sleeping Woman III. Suntrust Plaza's grounds is home to quite a few sculptures, several of which I'll post about in the future (there are some rather interesting stories behind some of them).